Ever heard of a capsule wardrobe? 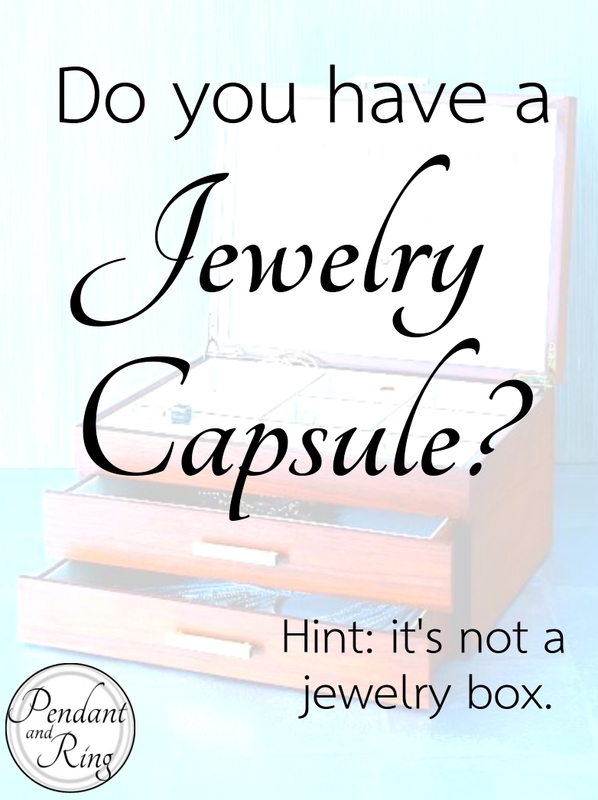 What about a jewelry capsule? The idea behind a capsule is that it holds just enough, not too much and not too little of what you need. The capsule wardrobe tames an overstuffed closet, streamlines your morning, helps reduce decision fatigue, and lowers your dry cleaning bill. A jewelry capsule serves a similar purpose, although you are on your own with the dry-cleaning. If you have only the things you need in your jewelry capsule, you can easily pick what you will wear that day, reducing the time and energy it takes to look your best. To make your own jewelry capsule think about your life. You probably spend most of your life in casual and business clothes. You may also have gym clothes, and formal attire, but the majority of your time you are either in a casual situation or working. 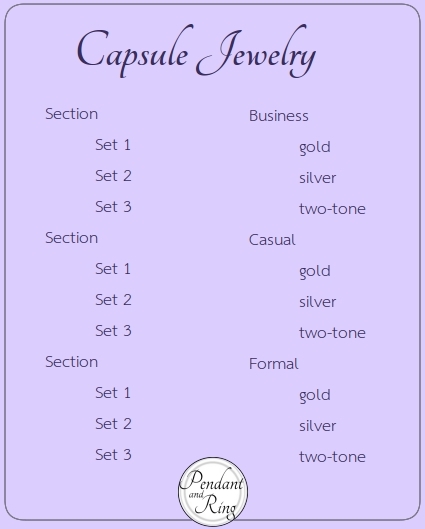 When it comes to your jewelry capsule you can prepare both casual and business sets. Some people like to wear only gold and gold-toned items, or only silver and silver-toned items. But a capsule does not make you choose. I like both gold and silver, and sometimes like to wear both at the same time, so my capsule contains silver, gold, and two-tone pieces. Your capsule contains sections and sets within the sections. Gym jewelry is a new development. Silicone wedding rings are increasingly popular at the gym. They are inexpensive (in case it gets lost), comfortable (even in boxing gloves), and they come in gold-tone, rose-gold, silver-tone, and a variety of print options. It depends on how often you go to the gym and how you work out. Within each section you keep sets. A set includes anything you want. My sets include my wedding ring, a right-hand ring, a necklace, and earrings. The purpose of a jewelry capsule is the same as a capsule wardrobe – to simplify. In today’s more casual work environment it is possible to have a business/casual section, which is what I do. You can keep your jewelry capsule as simple, or make it as complex as you like. My jewelry capsule is very simple. I also have a small box of interchangeable charms and a small box of earrings. Seasonally I swap out earrings and charms. That’s all I need to pull a look together, and it takes no time because a little organization goes a long way. Whether you keep a small or large jewelry capsule this method can help you keep your jewelry organized and make looking your best as easy as breathing.